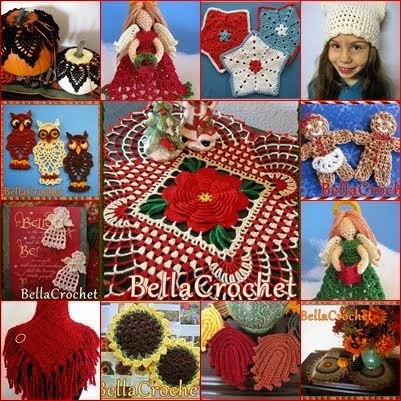 “My treasure hunt is for a special crochet pattern. I hope by posting these pictures of my mom's doily I will be able to find someone that has or knows where I can find this pattern. 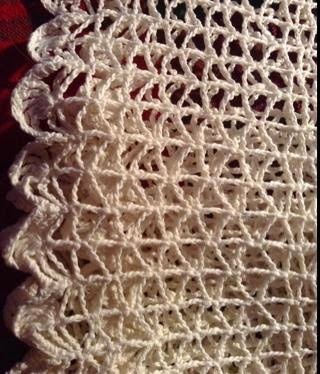 My mother crocheted this doily while she was pregnant for me in 1951. 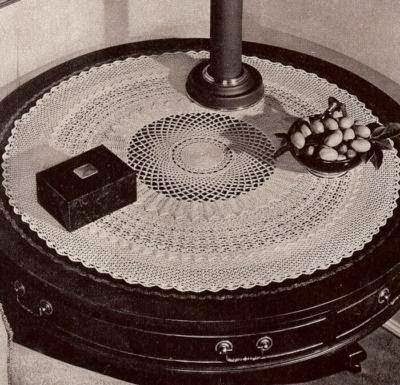 For many years the doily was always kept on a large square table in our "front" room right beside the front door. My grandmother Josie's old fashioned lamp was the only other item on the table. When I was 4 or 5 years old, I used my kid scissors on a little section of the doily, and it was put away for many years and never brought out unless we were showing it to someone. About 40 years ago, my mother handed me the doily and said basically that I had cut up the doily, so now I could put my crochet skills to work and repair it. It wasn't easy to fix; but I did, and I returned it to her the following Christmas. It took her almost 30 minutes to find the repair! When she took more than 5 minutes to find the place I had sliced, I knew I could crochet as well as my mother--and she did positively beautiful work. This doily is now mine and every now and then it is brought out and put on display. I have looked for this pattern for many years. My mother and my aunts generally used Coats & Clarks patterns, and they shared them around the family. No one in the family remembers the pattern, but they do remember the doily that was on the table for so many years. After Dawn posted her story and pictures of her doily, several other members of the group made suggestions and guesses as to where the pattern could have originated from. Dawn realized that the picture Penny had found was of her doily! She was off on the hunt again, but this time she had an image to go by. Within minutes, she had found a copy of the pattern listed for sale on Ebay, which she immediately ordered. 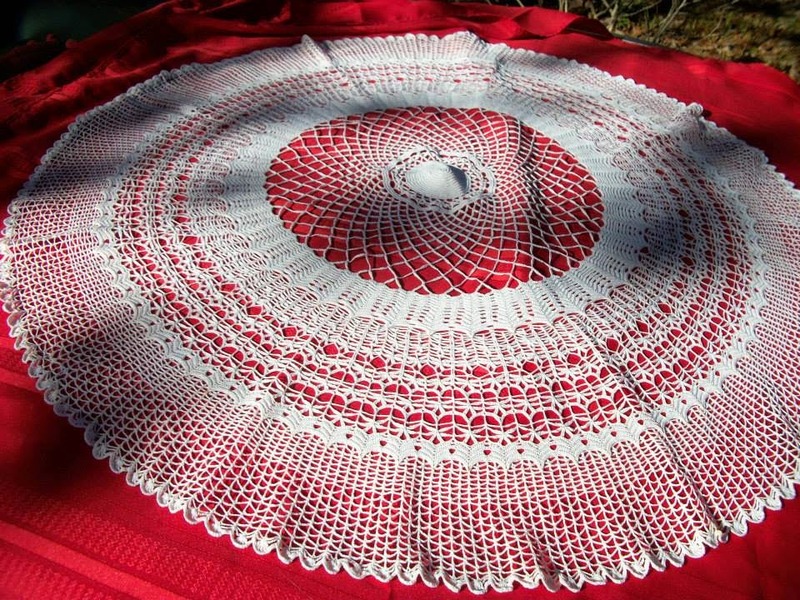 Another member of the group, Cynthia Alicea, posted that she recognized the doily, and that the pattern was originally published as “Tea Table Cover” in the Woman’s Day 1949 Crochet Annual. Cynthia also mentioned that the pattern could be found for free online. But Dawn replied that she had been searching for the pattern for so long that she was happy to pay for a copy. 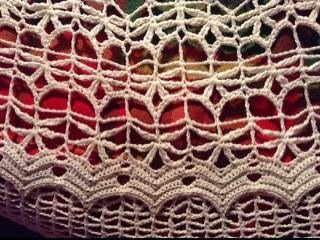 “When mom made this doily she had been crocheting for only a few years. I think she did a great job considering this was one of her early projects. When you look really closely, you can see how consistent her tension and stitches were. She used Size 30 Coats & Clarks for the doily and I was able to use the same thread. I'm glad she used white because that made making the repair a little easier. Dawn and her husband will be celebrating their 45th wedding anniversary on New Year’s Eve. In addition to their two daughters, they have four grandsons. Dawn’s husband is a retired Marine and technology electrician. Dawn says she is looking forward to retirement in a few years so that she can do even more crocheting. I love a good mystery, and I love happy endings even more. Dawn’s story has both, and it is even about crochet; what could be better? Thank you for sharing your story, Dawn! All pictures are used courtesy of Dawn Speaks. 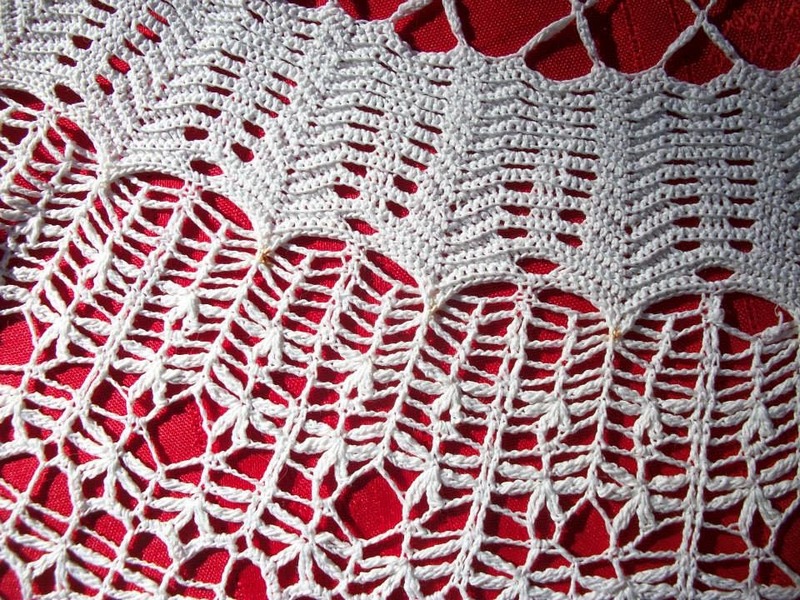 Ann, Thank you ever so much for adding the story of Mom's doily and my search for the pattern over the years. 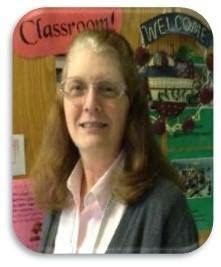 Thank you also to Penny Freshour and Cynthia Alicea for their help in finding this pattern. Creating has memories of the heart. This was a lovely story,and this is why we as crocheters create. It is our heritage, a gift we pass from generation to generation. I loved this story when I read it on the Threadies group, and really enjoyed reading it again here. We just never know, when we create something, what effect it will have on others. Beautiful story! It is stories like these that make all of our hearts smile. It's so wonderful she was able to find the pattern. Thread crochet is such a beautiful art form. I loved how she said that everyone remembered the lovely doily. Doilies do that to you, the reach out and grab your heart! Awesome group of hookers...there is something about the hook that unites us. I am happy that she found her pattern..it is lovely. I'm so glad we could help you in the search Dawn. I'll always remember your wonderful story.